Portadown striker Darren Murray took little pleasure in Saturday’s 10-goal thriller at Shamrock Park. Murray grabbed the home side’s final goal to put Portadown clear by 5-3 on 81 minutes. Darren Murray celebrates putting Portadown into a 5-3 lead on Saturday against Ballymena United. Pic by PressEye Ltd. 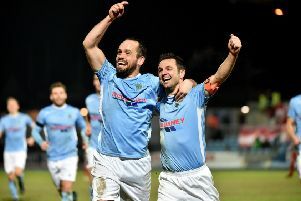 However, Ballymena United battled back over the closing moments to finish with a share of the spoils.